BALI, Indonesia - An American man has confessed that he killed his girlfriend's mother in a luxury hotel on Indonesia's Bali island, and the girlfriend has acknowledged helping him stuff the body into a suitcase, police said Friday. Heather Mack, 19, and her boyfriend Tommy Schaefer, 21, both from Chicago, were arrested in Bali on Aug. 13, a day after the body of Sheila von Wiese-Mack was found in a suitcase inside the trunk of a taxi at the St. Regis Bali Resort. "Schaefer confessed to killing von Wiese-Mack during police interrogation," police chief Col. Djoko Heru Utomo told The Associated Press. "He was hurt and offended by the victim's words in an argument with him. That is the motive for the murder." He said Mack, who is three months' pregnant, admitted in a separate interrogation that she helped Schaefer stuff her mother's body into a suitcase. Utomo said Schaefer and Mack were accompanied by their Indonesian and U.S. lawyers during the interrogations. Attempts to reach the Indonesian lawyers were not immediately successful. The couple has yet to be formally charged. Utomo said officers hoped to complete their investigation and file their case with prosecutors before the couple's detention period ends in mid-October. Police have said the couple hired the taxi and placed the suitcase inside the trunk. They then told the taxi driver that they were going to check out of the hotel and would return. 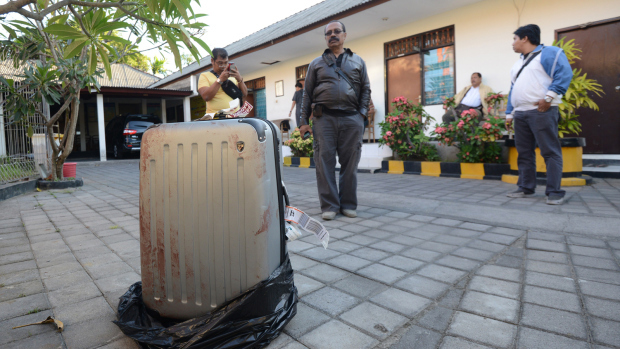 After they didn't show up, hotel security guards who found blood on the suitcase suggested that the driver take the taxi to the police station, where officers opened the suitcase and discovered the body. Von Wiese-Mack was the widow of highly regarded jazz and classical composer James L. Mack, who died in 2006 at age 76. Von Wiese-Mack was a member of a century-old Chicago book club called the Caxton Club. She had varied interests including Asian literature and Wagnerian opera, according to a May 2013 profile of her in the club's publication, Caxtonian.